Here in the Pleasant Valley neighborhood, after the old 122nd Avenue Bridge was removed near Leach Botanical Garden, the “Road Closed” sign meant there was no longer any way to cross Johnson Creek. After the 122nd Avenue Bridge – some call it the “Leach Botanical Garden Bridge”, because it’s near the entrance to the park – has been out of service for years. 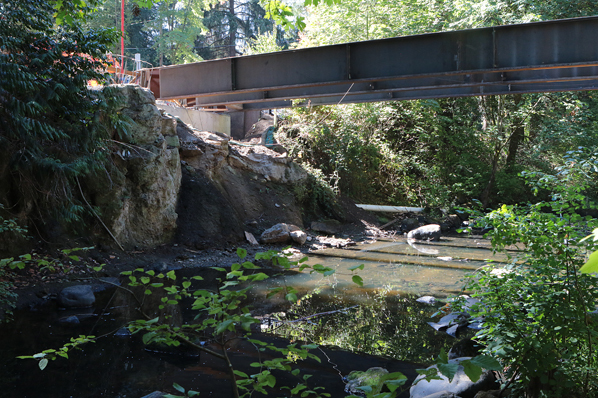 Now, contractors for the Portland Bureau of Transportation (PBOT) have been busy this summer building a new span to replace it across Johnson Creek. and to read our July update on this project, CLICK HERE. 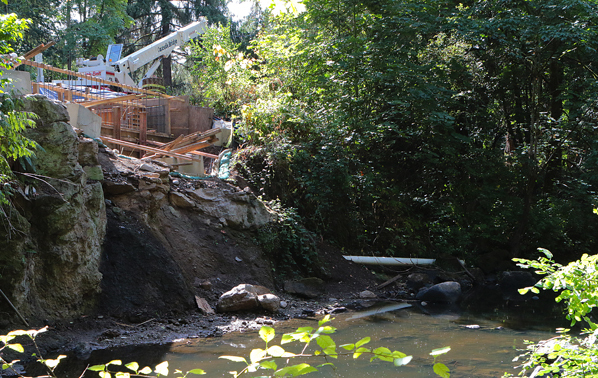 Johnson Creek flows freely, now that the old bridge piers have been removed to make way for the new bridge. Thanks to funding from the U.S. Department of Transportation / Federal Highway Administration’s bridge program, PBOT was able to move up the timetable for this project, which is estimated to cost $3.4 million. In mid-September, workers finish pouring new pilings and landings to support the entire weight of the forthcoming new free-span bridge. 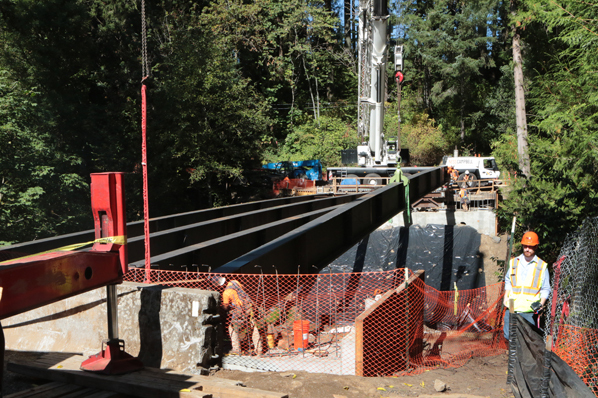 After the old bridge was dismantled and the piers removed from Johnson Creek, the contractors began the work of stabilizing the sides of the ravine, by sinking pilings deep into the ground to support the entire weight of the new, approximately 120 foot, span at the landings. 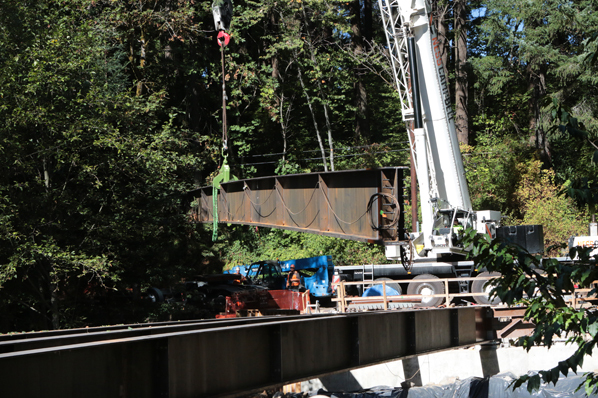 Another 20 ton steel girder is hoisted from its trailer, to place at its final destination across Johnson Creek. “Undergirding the new bridge deck are five girders, each weighing about 40,000 pounds,” said PBOT Pubic Information Officer Dylan Rivera. It was an amazing sight to see the massive girders lifted off a trailer that had been carefully maneuvered down the narrow and twisting road, a couple of blocks south of SE Foster Road. Crew members guide the new girder into place. The crane operator deftly lifted the 20 ton beams of steel; and, with the help of workers on the ground, adroitly turned it 90? – narrowly but successfully missing obstacles such as trees, utility poles, and overhead wires. Each girder was set in place; and then the process repeated. 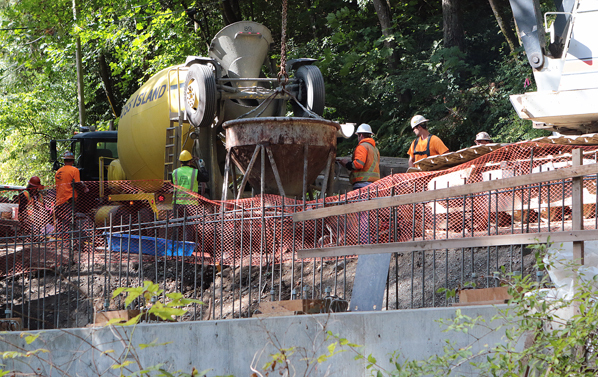 Now, Rivera reported, crews are creating forms to install a cast-in-place reinforced concrete bridge, which will be reinforced with internal steel bars. Soon, these girders will support a reinforced concrete deck. 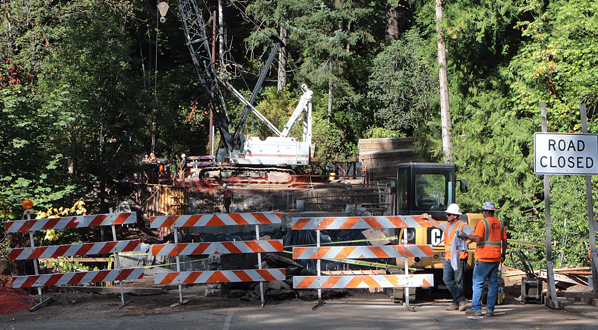 The project is on schedule, and the new bridge may be open as early as December of this year.